A total of nine Indian cities figure on the latest edition of ‘Global 300’ cities – the annual JLL ranking exercise, which represents 300 major cities that are the focus of commercial activity and interest, 40% of the world’s economy, and three-quarters of global real estate investment. In an ever-changing world, more urban centres in India are rapidly emerging as players on the global stage – moving beyond the powerhouses of Mumbai, Delhi and Bangalore. While the megacities of Delhi and Mumbai rank in the ‘Global Top 30’ – thanks largely to their huge scale, other cities such as Bangalore, Chennai and Kolkata sit within the ‘Global Top 100’ – with Hyderabad sitting just outside. Mumbai (17th) is among the 20 largest cities in the world by gross domestic product (GDP), while Delhi (22nd) sits just outside of this – with both cities having a GDP of more than $400 billion. This also makes them the fifth and sixth largest cities in Asia, respectively, only behind Tokyo, Shanghai, Seoul and Jakarta. Both the megacities demonstrate their sheer scale by being larger than the likes of Singapore, Hong Kong, Washington and San Francisco. However, in GDP per capita terms, Mumbai and Delhi lag behind their global counterparts, due to their large populations. While both Indian megacities significantly lag Shanghai, Beijing and Seoul, even the American cities and Singapore have per capita incomes that are three to four times larger. In terms of corporate presence, Mumbai comes ahead of San Francisco, Shanghai, Sydney, Singapore, Washington, Atlanta, Toronto etc. Delhi, too, is ahead of cities like Guangzhou and Frankfurt. Corporate presence is based purely on number of headquarters of the Forbes 2000 list. The scale of the Indian market means that 38 companies – based in either Delhi (14) or Mumbai (24) – make the list from India’s largest IT firms, banks and energy firms. This does not account for regional or secondary offices of global firms, which may help account for Mumbai and Delhi’s high positions. Although some attention is starting to turn to the country, India’s cities are not large recipients of direct real estate investment – given the difficulties in accessing stock and market transparency. Mumbai sees similar investment volumes to cities such as Guangzhou and Mexico City – but just 5% of those seen in Shanghai (USD 37 billion) and 10% of those seen in Beijing (USD 18 billion). Over the past three years, Mumbai has attracted USD 1.7 bn of real estate investment, while Delhi has seen USD 0.6 bn. This puts both cities outside the ‘Global Top 100’ real estate investment destinations, despite their scale. These markets are dominated by domestic players, rather than international investors. 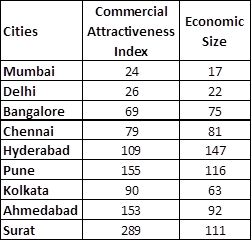 These lower rankings suggest that, while Mumbai and Delhi have the scale to match their global counterparts, they are underperforming in terms of direct real estate investment. It is also indicative of an historic preference by investors to look to development and debt lending to gain exposure to real estate in the Indian market. However, a number of key policy-level changes taken by the government in recent times such as RERA, REITs, simplification of taxation, easing of FDI restrictions, are expected to counter this. Along with completion of new high-quality stock by commercial developers, which will increase the amount of investable assets across India, these developments are encouraging increased interest from international investors of the likes of Blackstone, GIC and Brookfield.